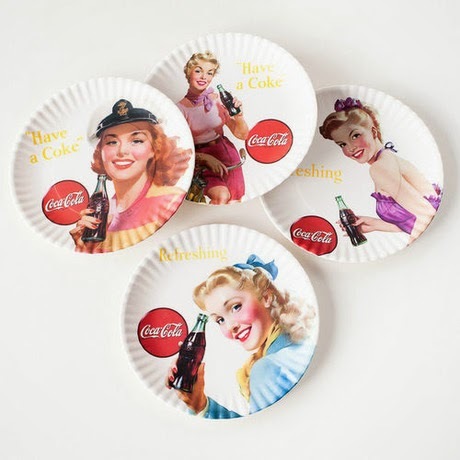 As someone with a major addiction to Coca-Cola (yes it’s the first thing I have each morning…very very bad) these plates would be the perfect addition to the house. The vintage inspiration coupled with the Coca-Cola is an ideal combination. The plates say “have a Coke”- sure don’t mind if I do. I actually think I will buy them because they are reasonably priced and just too adorable to pass up. I used to shop at Forever New all the time but not so much anymore. While I love so many of my older pieces, these days I see too many other people in Forever New clothes- just shows how popular it is in Australia. Regardless, this bag stood out to me. 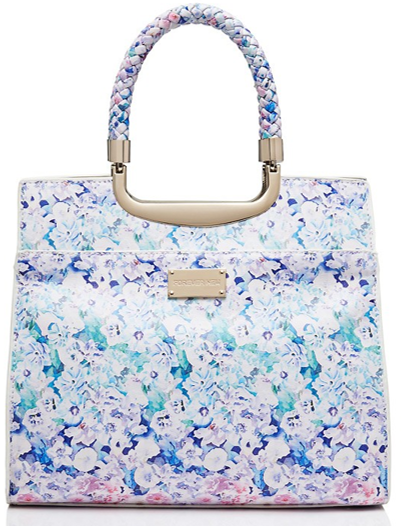 The colours are so pretty and I love the beautiful print; I often wish there were more printed bags around. 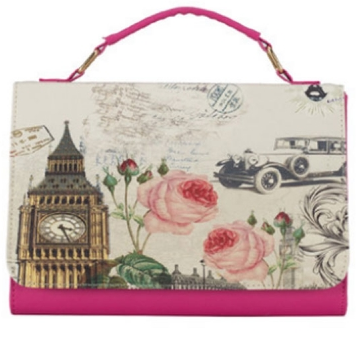 It’s a really girly, lovely and delicate looking bag. It’s now on sale too. These next two pieces are extra amazing to me because they are designed by my dear friend Jacqui from the blog Fashion Pho. I was so excited when I first heard that she was starting her own fashion label and I’ve felt really proud at watching her success. The reason I love her pieces is because they are so fun, colourful and creative; sometimes I feel like these are the designs I have been waiting for in the fashion world. I’ve said so many times on my blog that I wish there was more star print around. Also recently I’ve started to love matching separates; they are such an adorable concept. Do I even need to mention how much I love the heart shaped pocket and the heart shaped cut out? You may remember, from my post here, that Jacqui named one of her initial pieces after me; my namesake Imogen Skirt was such an honour and is very exciting. This star printed skirt incorporates many of the aspects which I admire about the Imogen Skirt too. I posted about B.A.I.T footwear in one of my previous wishlists and I still adore them so much. I actually prefer the t-bar version I’ve posted here and this is the most beautiful shade of blue. 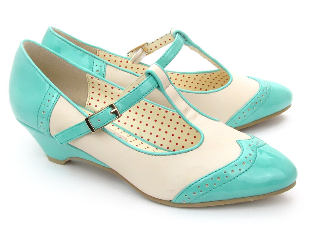 I don’t have many pairs of vintage inspired shoes so I’d love to add these to my shoe collection. This wishlist is rather unintentionally becoming blue inspired. I would love to pair these with the matching set above. 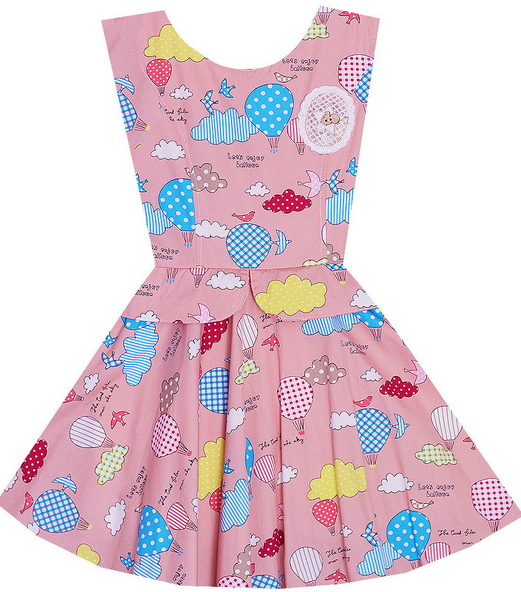 Another recent love of mine is hot air balloon print (and why not isn’t it just the best?!) but I am yet to add any to my collection. This dress is amazing given that it’s pink and combined with all things girly. I love the dresses from Bonne Chance Collections and, ever since I bought my first dress from their website which I posted here, I’ve wished I could own every single piece they’ve ever made. I am starting to build up quite a collection of pieces from OASAP since they are my main blog sponsor. I’m often on their website and this sweet little bag caught my eye. I hope I can get it when I next have credit. The combination of pictures make it such an adorable design. They have a similar version with a picture of a vintage inspired dining room. I’ve loved this dress for so long now that I’m surprised it hasn’t appeared on my blog before. Although Alannah Hill was my favourite ever store for so many years I don’t like quite as many pieces there right now. The style doesn’t seem as bold and girly to me with the last couple of seasons. 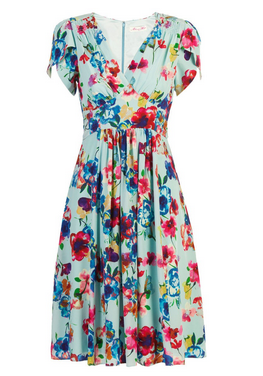 Regardless, I adore this dress as much as I’ve ever loved Alannah Hill dresses. I sure do adore florals and the blue background is a pretty shade. It looks like a lovely cut and material too. Unfortunately it is well out of my price range so the chances of it making its way into my wardrobe are fairly slim, but I’m allowed to admire it, right? I love all of these vintage looking pieces!! Imogen, OK…..I've never seen these cocoa cola paper plates, they are soooo cool. They would be nice for a party or just a barbecue. And the shoulder bag is very pretty and unique. I don't know where you get your things, Imogen, but they are always so darling, and such a fun sense of style. What fun and unique pieces! I especially love the Coca Cola Plates and that last floral dress! The print and colors are so pretty! Coca Cola is not really into my tastes! I am actually trying not to make any wish lists! I am still struggling with my never ending closet cleaning…. its coming along, rather slowly but still coming along. I love the elements of turquoise in all of these photos. Love your wish list, I haven't done a post like this for a while so I must make a note of this for future posts!